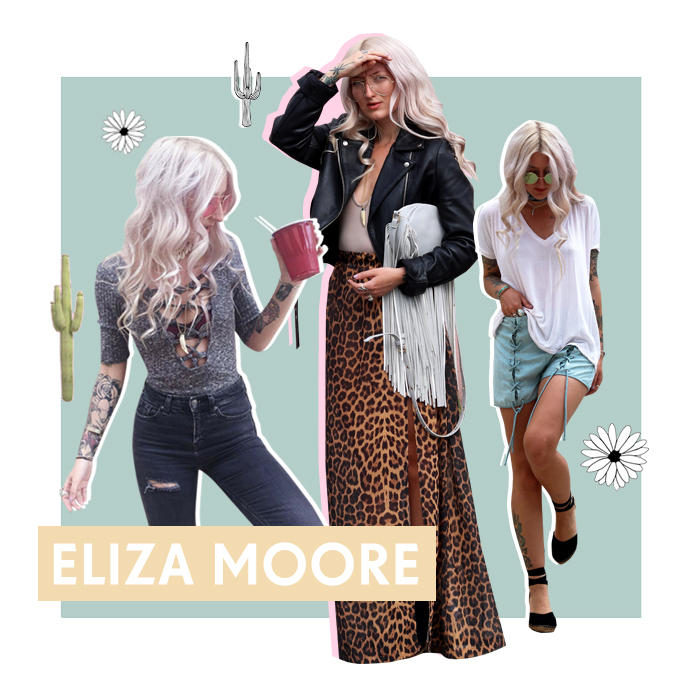 Blogger and super stylist Eliza Moore�has a festi-feels style that is a deadly mix of bohemian babe meets rockstar cool. We caught up with her to get her thoughts on all things festival. My festival style doesn�t change too much from my everyday rocky and bohemian style.� I�d say I take a very tough but pretty approach – always super laid back. I�d rely on leather jackets and ankle boots�for that edge, with nice floaty dresses and pretty jewellery. What does a typical day at a�festival�look like for you? Seek out a coffee or a cup of tea to start myself up for a new day. Catch some rays, lounging and hanging around with my friends being mellow! At the sun goes down, and the night begins find out a little party paradise spot. In the sun somewhere, I am a sun worshipper and love laying in it all day. At night I�d be dancing somewhere cute and pretty! What gets you ready to party? 60s and 70s rock �n� roll, but also love disco and funk as well. What festival essential you couldn�t live without? Probably a brush, my hair gets wild and so matted if I don�t watch it! What was your inspo for your festival look? Do you have a muse? My easy go to, for summer bohemia festival style, are the Olsen Twins, Kate Moss, Nicole Richie and Vanessa Hudgens. 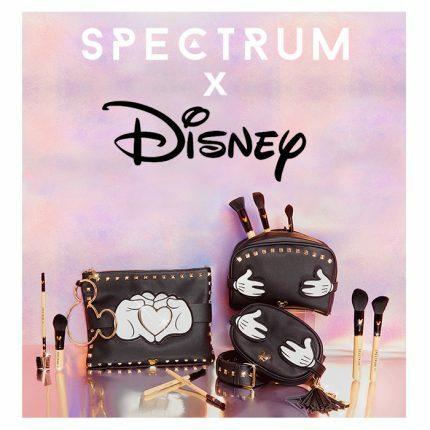 Fave beauty trends you�re looking forward to incorporating into your festival look? I love a really good radiant, glowing complexion – very Gigi Hadid. So I love using bronzer, and highlighters to get that ultimate heathy golden girl look.�I play around with lots of glow and shimmer. Fave means of festival social media? I rely heavily on being visual, so LOVE Instagram the most! I am terrible at Twitter. Lots of�jewellery,�Portable phone charger, and pink coloured aviators! Dry shampoo for a more matt beachy hair, or two simple side plates!�Miceller cleansing water and decent cotton pads! Probably my all-time favourite band The Growlers, love those fellas! Dream festival squad � dead or alive? Probably my favourite retro babes! 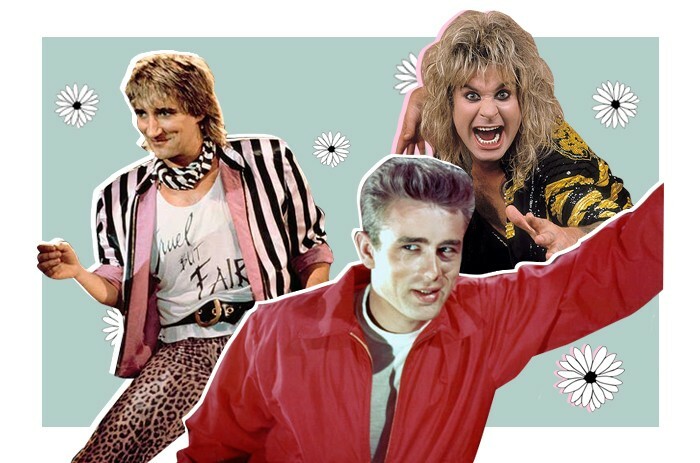 Farrah Fawcett, Lana Del Rey, James Dean and young Ozzy Osbourne and Rod Stewart in their younger days. I love armlets and cuffs. They really bring an outfit together. Definitely not bringing enough layers, and getting way too cold at night. At Boardsmasters festival, I had my first go at Surfing – that was a good memory, even though I sucked! Fave trend from the new season you�re looking forward to incorporating into your festival look? I�m a huge lover of recent Gucci, and really into their clear lens aviator look! YSL, and their way of doing that western rock �n� roll vibe. I love that musician, �I�m with the band� feel! I am a tea and coffee addict, so that works for me. Once I am home, I lay low and watch lots of TV. Beach Goth in�California�but I love the low key surfy beach ones too – Boardmasters I love. My bestie Sara! We share our love for beautiful bohemian fashion.